For high resolution inspection applications such as semiconductor defect review, image stability is of paramount importance because in most cases it is the limiting factor for overall performance. One example is a Scanning Electron Microscope (SEM) which can provide a theoretical image resolution of 1 nm. In practice, however, the resolution is often degraded significantly by the effect of external noise on the tool. With the challenge of shrinking design rules and nanometer size defects, coupled with the fact that it has become increasingly difficult to prepare a site to meet the tool’s specifications, equipment designers must pay extra attention to the interaction between the mechanical structure, positioning system and environmental noise so that optimal tool performance can be achieved. In this article, we will first identify common cleanroom noise sources such as floor, acoustic and electromagnetic noise, and then understand their consequences. We will discuss noise measurement techniques and guidelines for various types of equipment. Active and passive air isolators, acoustic enclosures, and active field cancellation systems will all be examined as potential solutions to noise problems. The effect of environmental noise on the positioning system will be discussed for various stage configurations (i.e., servo and non-servo control). For non-servo control, the equations for linear resonance will be developed for a typical ballscrew or leadscrew drive assembly as an example. Design practices that increase the resonant frequency of such drives will be discussed. Tuned mass dampers will also be presented as a method of reducing resonance amplification of noise for non-servo systems. A servo system model will be developed to examine its disturbance rejection capabilities. Linear brakes will be presented as a method of overcoming some of the noise rejection limitations of the servo system. In addition to the above hardware solutions, software corrections based on signal/image processing will be discussed as an alternative way of rectifying some image stability problems. In some situations, software corrections may be the only cost-effective solution. Semiconductor metrology and inspection equipment represents a multi-billion dollar market worldwide per year. These tools are used to find defects in the integrated circuit (IC) fabrication process. The defects provide clues to the source of the problem, which the fab engineers can then identify and fix. This monitoring process is referred to as yield management and is required to have a rapid turn around time, such that high return-on-investment (ROI) can be achieved. As such, it poses two seemingly competing requirements for the tool: high sensitivity and high throughput. For a production fab, in-line wafer inspection is typically performed on roughly 20% of the total wafers at each inspection point, depending on the maturity of the process, the complexity of the product, and the particular process step. Even though only a fraction of the wafers are being inspected, the volume of defects need to be examined is quite huge. Hundreds or even thousands of defects from each wafer need to be located, sorted, reviewed, and analyzed to identify yield-limiting defects. The majority of wafer inspection tools use either photons (e.g., laser), or charged particles (e.g., electron beam) as the interrogation agents. Based on the illumination and collection scheme, the optical tools can further be categorized into bright-field (image forming) or dark-field (light scattering) tools. Tool sensitivity is usually quantified by the smallest feature that can be resolved within the diffraction limit, which is proportional to the wavelength of the light source, as well as the pixel size of the imaging system. As such, the use of UV light (100 to 400 nm) provides a better resolution than the visible light (400 to 780 nm). Similarly, the use of electrons gives a much higher resolution than photons because of electron’s short wavelength (e.g., 0.12 nm when accelerated with 100 Volts). In principle, a bright-field (BF) tool illuminates the object through the objective aperture, and collects both the scattered and reflected light through the same aperture to obtain an image. On the other hand, a dark-field (DF) tool only collects the scattered light from the object. DF tools have the throughput advantage because they can detect defects much smaller than the spot size. In other words, the field-of-view (FOV) of a DF tool can be made much larger (on the order of several millimeters) than the BF tool (less than 1 mm). The larger FOV in the DF tools generally means higher throughput. Wafer inspection using electron beam (e-beam) has several advantages over optical tools. The e-beam tool provides much higher resolution (as high as 1 nm) due to its small spot size. Furthermore, it can detect electrical defects through the “voltage contrast” mode, which is essential for High Aspect Ratio Inspection (HARI). The major drawback of the e-beam tool is its throughput, which is several hundred times slower than an optical DF tool, because of its much smaller FOV (typically less than 100 μm). For optical tools, imaging is normally done by using a charge coupled device (CCD) camera operated in either area mode (step and image) or time-delay-integration (TDI) mode (continuous scanning). Some DF tools employ a scanner such as an acousto-optic deflector (AOD), coupled with one or more photo-multiplier tubes (PMT) to collect scattered light from the wafer in a raster scan fashion. E-beam tools are similar to the raster scan approach, in which the electron beam is steered by a pair of magnetic coils that control the scanning across the FOV. One or more electron detectors are used to collect the back-scattered and secondary electrons for image forming. In either case, sophisticated signal processing (such as die-to-die comparison, thresholding, Fourier analysis, etc.) is then used to improve the signal-to-noise ratio and to determine whether a defect is present. Because of the increasing stringent requirements on wafer inspection as stated above, tool designers need to work with a much reduced error budget. In addition, previously insignificant design concerns such as vibration immunity are now becoming critical. Most high resolution inspection tools are extremely sensitive to the cleanroom environment. The environmental effect is even more apparent in high magnification applications (> 25,000X) where a minute disturbance can have a significant impact on the image quality. These disturbances disrupt the path between the imaging optics and the object being inspected in a random or oscillatory fashion. Common cleanroom sources that can affect the tool performance include floor vibrations, acoustic noise and Electro-Magnetic Interference (EMI). Figure 1 illustrates the affect of the sources on the image quality. The image on the left shows a vibration-free SEM image, while the image in the middle is its time-integrated image under the influence of vibrations, and the image on the right represents the same vibrating image in slow scan mode. From the middle image, we can see that the details of the structure are masked by the presence of vibrations, and the image appears to be quite blurry. The slow scan image shown on the right is usually used to quantify/identify the source of vibration. Figure 2 illustrates the three sources and how they affect the tool’s performance. The objective here is to design the tool so that it could maintain the imaging path as close to the ideal path as possible in various cleanroom environments, even under the influence of the sources. Cleanrooms, like other structures, respond to excitations when the frequency of some external or internal sources matches one or more of the natural frequencies of the facility and its support structure. This effect is especially significant when it is above the ground level, and is generally stronger in the horizontal direction. Some common external building excitations include wind gusts, aircraft flyovers, passage of railroad trains on nearby tracks, large motor trucks on nearby roads, constructions, earthquakes and volcanic effects. Internal excitations include building machinery such as cooling fans, refrigerators, air conditioning systems, hoists, elevators, conveyor systems, internal vehicles, and even foot traffic. All of these sources not only can create building vibrations, but also can release particles in the cleanroom. Generally a tool manufacturer will design a particular tool to be operated under a set of environmental requirements so that its specified performance can be met. 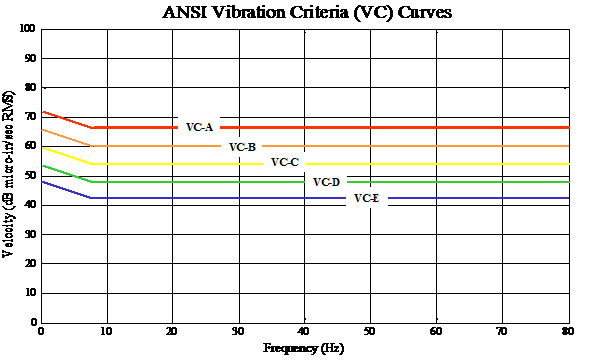 These requirements do not necessarily match up with the generic ANSI vibration criteria (VC) generally used for the construction of fabs. The VC curves, which are shown in Figure 3, were first published in the 1980s and have become outdated for today’s high resolution applications. As such, site surveys are generally required to determine if a candidate site is suitable for a particular tool. The site survey data can be used to estimate the degree of image vibrations, as well as to determine whether it is possible to eliminate or reduce the effect of a source. Floor vibration data can be collected by mounting a high sensitivity (e.g., 10 mV/g), low noise (e.g., < 0.01 μg/√Hz) seismic accelerometer on the floor (or pedestal) of the candidate site. The accelerometer should have a frequency range of 0.1 Hz to about 300 Hz, and can provide a broadband resolution of 1.0 μG rms. The output signal of the accelerometer is fed to a spectrum analyzer or a data acquisition instrument where FFT is performed. The spectrum should provide an indication of whether there is any presence of strong vibration sources along the X, Y and Z directions in the bandwidth of interest. 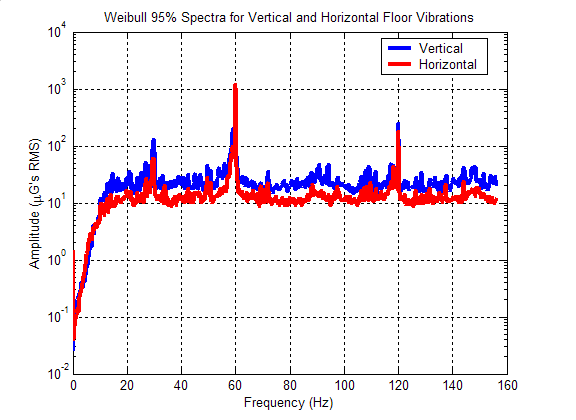 Figure 4 shows the composite floor vibration spectra in both the vertical and horizontal directions compiled using vibration measurements from more than 20 cleanroom sites. Large vibration amplitudes are seen at multiple of 30 Hz, which can be traced to the frequencies generated by common cleanroom equipment. Acoustic noise is probably the most common contributor to the image vibration problem in the cleanroom. The ambient noise, mostly generated by various equipment such as fans and pumps inside the facility, constantly bombards the tool. This acoustic energy, when interacting with the tool, is transformed into mechanical vibrations that then excite the various components of the tool, even the wafer itself. In most cases the low frequency acoustic energy (300 Hz and below) posts the greatest threat to the tool’s performance, because the low frequency energy is omni-directional and can travel through obstacles. In addition, larger displacement is produced by force at lower frequency. Thus, tool designers should avoid having component natural frequencies in the low frequency bandwidth. It is recommended to also take acoustic noise measurements for acoustic sensitive tools during the site survey. Acoustic noise measurements can be taken with a sound pressure meter or microphone that has a flat response down to 20 Hz. C-weighting is preferred when setting the sound meter or microphone, which provides a uniform response across the audible range. Like measuring floor vibrations, the same spectrum analyzer can be used to obtain a noise spectrum of the site. The sound pressure level (measured in dB or Pascal) can be taken in 1/3 octave band or linear frequency manner. When taking acoustic data, it is important to cover the full 360° so that the maximum noise level is measured. In addition to mechanically induced vibrations, a SEM can be affected by electro-magnetic interference (EMI) and radio frequency interference (RFI) caused by strong electro-magnetic fields (EMF), generated by nearby equipment (such as implanters or furnaces) or installations (such as large steel beams, power lines, transformers, or conduits). Electro-magnetic fields are composed of electric and magnetic fields, both found across a wide range of frequencies, from Extremely Low Frequency (ELF) up to gamma rays. Electric equipment, when plugged in but not necessarily turned on, generates electric fields (a.k.a., E-field). The electric fields are measured in volts per meter (V/m) and have relatively constant field strength over time. They are normally easy to shield with common conductive materials, if properly grounded. Magnetic fields (a.k.a., H or B-field) are produced by electric current (i.e., the equipment has been turned on) and will vary over time. They pass undiminished through earth, concrete and most building materials and are expensive to shield. The magnetic fields are measured in milligauss (mG) and their strengths decrease with distance as a function of the source type. The field spectrum can be obtained by using a magnetometer (Gauss meter) and a spectrum analyzer, similar to the techniques described before for acquiring vibration and acoustic spectrum. Unlike mechanical vibrations, the EMF affects the electron beam traveling down the column to the wafer because the EMF attracts or repels the electrons. 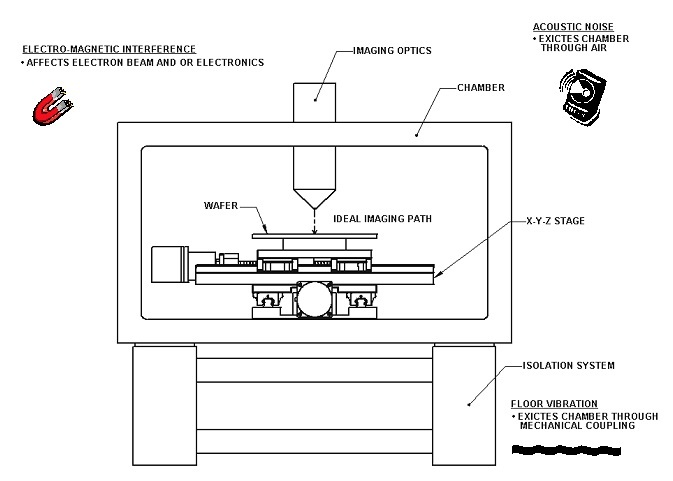 The effect of the EMF on the SEM image is visually indistinguishable from the mechanical vibrations induced by either the floor or the acoustic noise. All high resolution inspection tools incorporate some type of vibration isolation system. The main function of these systems is to reduce the transmission of vibration from the floor to the tool within a certain frequency range. Selecting the correct isolation system is dependent on the application and can be divided into three categories: vibration sensitive, settling time sensitive or both. While all high resolution imaging applications are vibration sensitive, only tools with high throughput are also sensitive to payload settling time. The majority of vibration sensitive applications can utilize a passive isolation system while applications in which payload settling time is also critical may incorporate an active isolation system. An active system might also be incorporated on a vibration sensitive tool if the site survey indicates a large amplitude noise near the natural frequency of the isolation system. The distinction is critical since an active system can cost as much as 5 to 10 times more than a passive system. The most common and least expensive passive system uses pneumatic isolators. Pneumatic isolators utilize a volume of pressurized air acting on a piston area to support the payload. To provide vibration isolation in all degrees of freedom (i.e., vertical, horizontal, tilt and twist) the piston is typically designed to behave like a pendulum that pivots in the plane of the isolator diaphragm. A typical passive isolation system consists of four isolators and three leveling values. The leveling values sense the payload height and change the air pressure acting on the piston as loading requirements vary. In order to maintain position stability with four isolators (only three points are required to define a plane) two of the isolators are independently controlled and two are operated with a single valve. By using servo control, active isolation systems can improve low frequency isolation and settling time performance. Active systems are available in a number of configurations each with different performance specifications and cost. The lowest cost method uses a pneumatic isolation system as described above with pneumatic servo control and inertial sensors for feedback. The primary benefit of this system is reduced amplification at resonance in the vertical direction only. The most common active system uses a pneumatic isolation system with voice coil actuators, a digital controller and a combination of inertial and proximity sensors for feedback. This system will provide improved low frequency isolation in not only the vertical but also horizontal direction. Settling time is also significantly improved because payload position changes are corrected using force from the voice coil actuators. Additional improvements in settling time can be obtained by feedforwarding stage position and acceleration information to the controller. A third type of active system uses a piezo actuator and passive elastomer mount in combination, along with a digital control and inertial sensors. When a system of this design has six active degrees of freedom it provides the best low frequency isolation performance in both the vertical and horizontal directions. For example, the natural frequency of this design is typically 0.5 Hz and at 2 Hz provides vibration isolation of approximately –20 dB. This type of piezo-based design, however, has the highest cost of all active systems. The low frequency response of the isolation system can be critical since it is not uncommon for cleanrooms with multiple floors to exhibit low frequency vibration (< 5 Hz). This low frequency vibration is usually attributed to movement of the upper floors and will be amplified if located near the natural frequency of a passive isolation system. Remedies to this problem include relocating the tool to a more desirable location in the fab, using one of the active isolation systems mentioned above or an image processing technique. 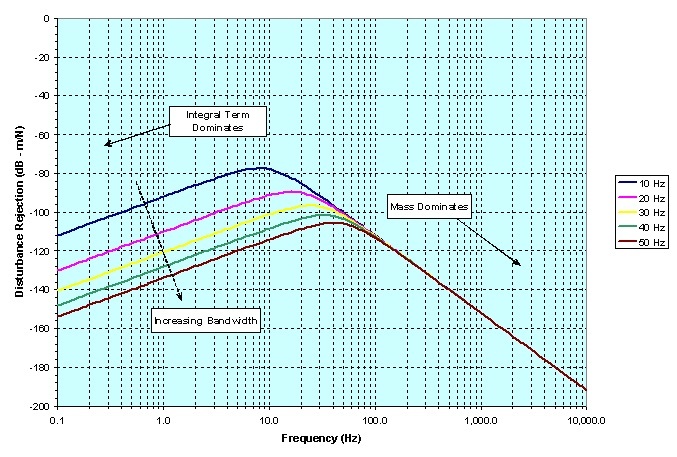 When comparing the low frequency performance of various active and passive systems, transmissibility curves should be utilized. Even with a properly selected isolation system, low frequency floor vibration can be transmitted to the tool through cables or flexible conduits. To reduce the transmission of acoustic noise, sealed enclosures can be utilized to protect the tool. The performance of these acoustic enclosures varies depending on the construction but they typically can provide noise isolation of -10dB at 50Hz. Unfortunately, there a number of disadvantages to acoustic enclosures which limit their use; they require additional cleanroom space, wafer transfer must occur through the enclosure, servicing the tool may be more complicated and they increase tool cost. To reduce or eliminate the affects of EMI there are generally three approaches: magnetic shielding, active cancellation or image processing. Magnetic shielding uses specialized materials to protect the column against EMI/RFI. One such material is Mu metal, a nickel-iron alloy with high permeability that shields the magnetic interference by attracting and diverting the field through itself. An active cancellation system, on the other hand, works by measuring the magnetic field at the sensor and then producing an equal and opposite field to counteract the source field. The cancellation system can handle multiple fields of varying frequencies and amplitudes, so tuning is not required. As long as the sensor position is not changed, the system will work without any disruptions. The cancellation system is capable of counteracting any fields that are approximately 25 mG peak-to-peak per axis (X, Y and Z) in amplitude over a frequency range of 1 Hz to 5 kHz. An additional pair of DC magnetic field sensors will counteract any frequencies below the 1 Hz range. Understanding the effects of floor and acoustic noise on the mechanical structure is critical for engineers designing high resolution equipment. Typically, a number of resonances in the optics-wafer structural loop contribute to image degradation. 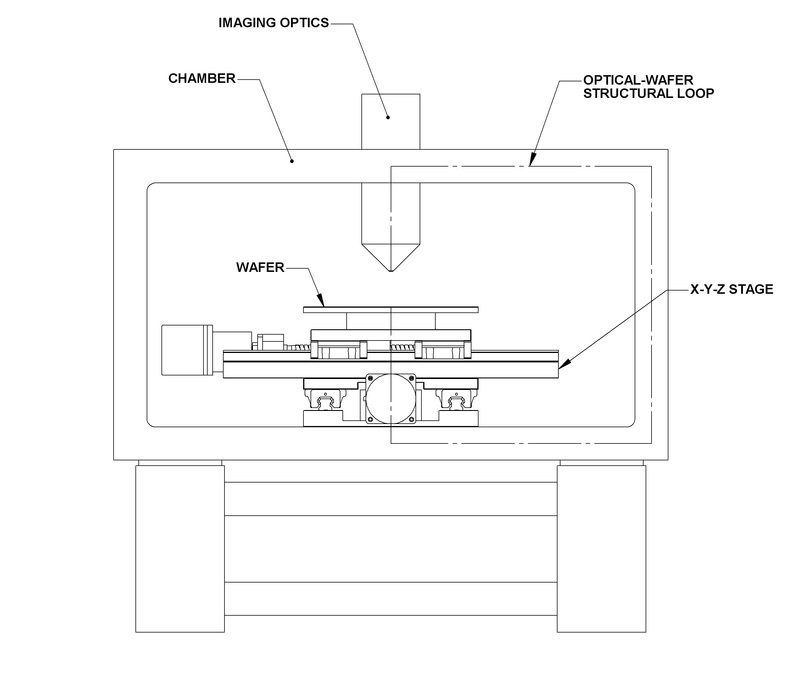 The optical-wafer structural loop shown in Figure 6 is the connection between the imaging optics and the wafer. In order to maintain a stable image any relative motion between the loop end points should be avoided. In practice, relative motion will be produced when the frequency of a noise source and mechanical resonance coincide. The amount of relative motion depends on the input noise level and the gain or amplification at resonance. For discussion purposes we will model our mechanical structure as a second-order, mass-damper-spring system. To understand the response of this system to input noise we can apply a harmonic forcing function to the payload mass over a wide frequency range. This analysis, called frequency response, compares the amplitude ratio or gain and phase shift of the output and input waves. A plot of gain versus normalized frequency is shown in Figure 7 for a second order system with different levels of viscous damping. 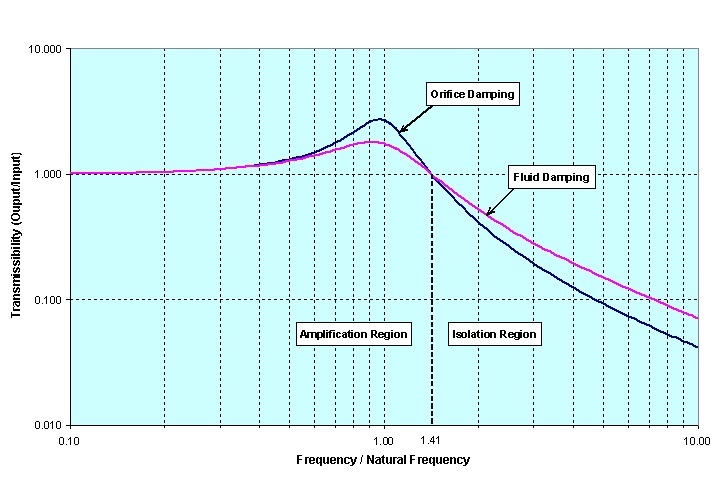 With a viscous damping factor of .05 the gain at resonance is 20 dB or the output wave amplitude is 10 times larger than the input wave amplitude. Since structural resonances tend to be very lightly damped (ζ < 0.2) the gain at resonance is typically greater than 10 dB. The lowest resonances should be determined in the design phase and compared with common frequencies known to exist in the tool environment. Usually resonances below 120 Hz can be very detrimental to image quality since they coincide with most common cleanroom noise sources (i.e., 50 – 60 Hz, etc). While an exact value depends on the tool sensitivity and site survey, a realistic target is for all structural resonances to be greater than 150 – 200 Hz. To meet this target the following components in the optics-wafer structural loop should be examined carefully: (1) support structure for imaging optics, (2) support structure for positioning system and (3) positioning system and wafer carrier. Items one and two are especially critical for systems using a vacuum chamber, which may have resonances due to limited wall thickness. Since models of the support structure can be rather complex the resonant frequencies and mode shapes are often determined using dynamic FEA analysis. When a prototype is complete a modal analysis should be performed to confirm the previous analysis and fully understand the limitations of the tool. If modal analysis uncovers a low frequency resonance originally not anticipated, the following approaches to the problem component may alleviate the sensitivity: increase stiffness, decrease mass, increase damping or a combination of all three. The positioning system can contribute to poor image quality in different ways depending on the type of motion; either continuous scanning or step and repeat. For continuous scanning systems the main concern is payload vibration induced by the linear bearings or drive system. With linear rolling bearings, payload vibration is caused by imperfections in the guide surface and rolling element. This condition is worsened when the rolling element recirculates through the loading area. To overcome these limitations, the use of non-contacting system components such as air bearings and linear motors has become widespread for continuous scanning systems in the semiconductor industry. For systems operating in vacuum environments the rolling bearing is still utilized but with decreased performance. While not as widespread another option is the use of vacuum-scavenged air bearings. For step and repeat motion the positioning system can affect image quality in other ways. The primary concern for step motor-based positioning systems is the lowest resonant frequency of the drive assembly. For positioning systems with servo control there are two primary concerns; static position stability or “position jitter” and disturbance rejection. The step motor operates in discrete intervals based on proper excitation of phase windings which align the rotor and stator teeth. Because of their discrete nature, step motor-based positioning systems have a distinct advantage over traditional servo systems with regard to static position stability. For imaging applications with step and repeat motion, the rotary step motor is commonly used and is often coupled to a precision ground ballscrew assembly as shown in Figure 8. Even though static position stability at the nanometer level is possible, an axial resonance in the ballscrew drive assembly can limit imaging performance. The stiffness of each drive component should be reviewed carefully during the design phase since the total drive stiffness can be easily compromised by the weakest link in the system. In many cases, however, improvements in the drive stiffness are required after the design is complete and the drive resonance has affected image quality. In this case, changes that will increase the resonant frequency can usually be incorporated into the design without significantly affecting the form factor. For example, any effort to increase the drive stiffness should focus on optimizing the bearing mount and nut bracket designs using static FEA analysis. Such reviews can offer major improvements especially with brackets that are assembled from multiple pieces or have attachment points far from the shaft center. Another example is the thrust bearing stiffness, which is provided by an angular contact bearing. By selecting a bearing with a 60° contact angle instead of the typical 30°, thrust bearing stiffness can easily be improved. Improving the screw shaft and ballscrew nut stiffness, however, usually requires a different ballscrew model and possible form factor changes. The screw shaft stiffness is a function of the screw shaft diameter, the shaft material and the unsupported screw length. Improving screw shaft stiffness with existing systems is difficult since the material and unsupported length are usually not variables and increasing the screw diameter will also increase screw inertia and space requirements. 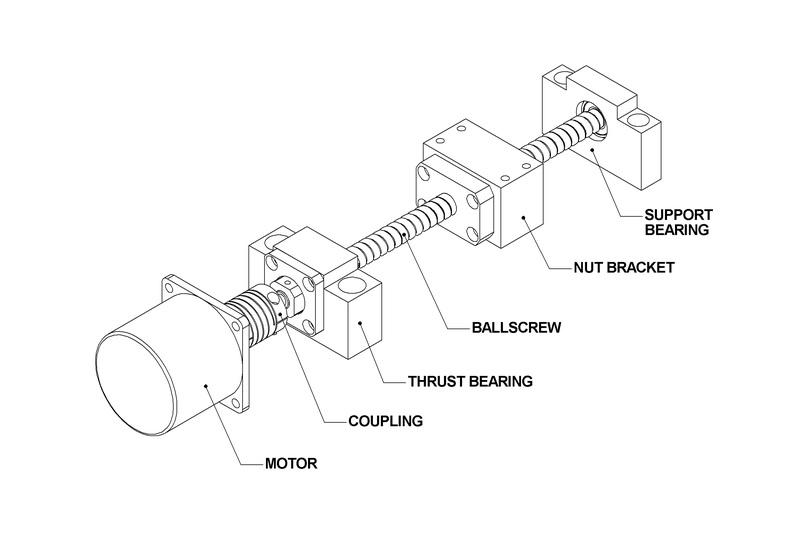 The ballscrew nut stiffness varies with the ballscrew size, preload method and applied preload force. The preload force is typically set at the factory and any increase beyond the manufacturer’s recommendations can decrease life and smoothness. Another way of increasing the drive resonant frequency is to reduce the payload mass. The best approach to mass optimization is to remove small pockets of material throughout the positioning system carriage. With this method a large number of ribs will remain to ensure minimal decrease in structural stiffness. Static and dynamic FEA analyses are recommended during the review to ensure structural integrity of the carriage. 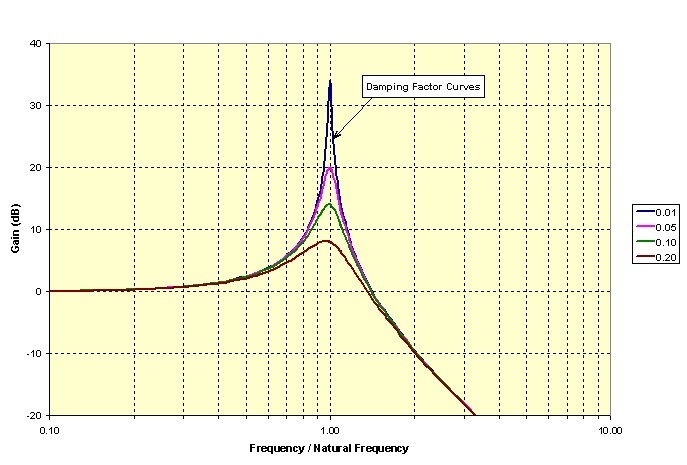 In addition to stiffness and mass modifications, a third approach is to increase damping by using a tuned mass damper, which will reduce the gain at resonance. The tuned mass damper consists of a second mass-damper-spring that is added to the stage carriage. If properly tuned, the new system has two resonant frequencies; one higher and one lower than the original frequency but both have lower gain because of increased damping. In practice, the tuned mass damper is often very inexpensive and can be implemented using a viscoelastic material for the spring and damper. It can be added as a retrofit to existing designs or for a new design and utilized only if necessary. One disadvantage of the tuned mass damper is that it only functions over a narrow frequency range. Unlike step motor-based positioning systems which utilize feedback to improve their performance, a servo system relies on feedback for its operation. The servo system compares the reference and feedback signals at a specified update rate to correct for position errors. While superior in most other functions the servo system does not have the inherent position stability that is present with step motor-based positioning systems. This does not mean that servo systems cannot achieve nanometer level stability but rather they are more sensitive to noise from amplifiers and external sources. In fact the sensitivity has only increased as the semiconductor industry has moved towards zero friction, non-contact components such as air bearings and linear motors. Excluding the affects of external noise sources, these high performance systems require a high resolution feedback device, linear amplifiers, shielded cables and a well tuned servo controller just to meet the position stability demands of some high resolution imaging applications. In many cases it may be easier to meet position stability requirements by selecting drive components with friction such as a ballscrew drive or linear piezo-electric motor. The drive friction in these systems helps to maintain stability if used in conjunction with a proper deadband setting on the controller. When including the affects of cleanroom noise sources the disturbance rejection of the servo system must be examined to see if the position stability requirements can be met. The disturbance rejection of the servo system indicates the amount of position change that will occur when an external force is applied to the carriage. Figure 9 shows the disturbance rejection for a linear motor system with PID controller over a wide frequency range and for different servo bandwidths. A higher servo bandwidth will provide better disturbance rejection at low frequencies where the integral term dominates the response but not at higher frequencies where the mass dominates. Even a high bandwidth servo system (~ 50 Hz) cannot typically provide the disturbance rejection needed to meet nanometer level position stability in the presence of cleanroom noise sources. As mentioned before, the design objective for high resolution tools is to maintain a stable image path without any relative motion between the imaging optics and the object. If the relative motion cannot be effectively eliminated by mechanical means described above, we can consider alternative ways of reducing this relative motion. One way to accomplish this is to employ active image stabilization methods. Unlike mechanical damping, active image stabilization methods do not attempt to decrease the physical vibration. Instead, these methods constantly change the imaging path so that it matches up with the motion of the object, which is sensed by high sensitivity accelerometers, capacitance probes, or laser interferometer. The net result would be very little relative motion (and hence perceived stable images) even though the absolute motion may be quite large. 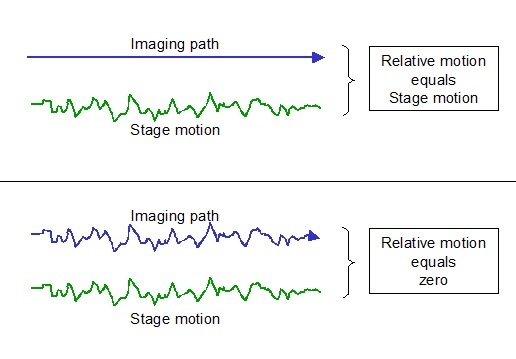 For example, stage accelerometer signals can be fed to an analog or digital electronic filter that then incorporates this extra motion to the normal scanning motion, as shown in Figure 10. In addition to electronic filtering, software based image stabilization can also be utilized to “clean up” the vibration. One example of such method involves the use of feature recognition on the first image so that some unique features are identified and located. The software then automatically calculates the offsets of the features between the subsequent images and the first image. These offsets are then applied to adjust the display so that the subsequent images appear to align to the first image. According to Nyquist sampling theorem, the software alignment method can only deal with vibrations with frequencies up to half of the frame rate. For example for a 30 frames per second imaging system, the software alignment can only address vibrations up to 15 Hz theoretically. Today’s high resolution wafer metrology and inspection applications demand high sensitively and high throughput. As such, tool designers need to pay extra attention to the interactions between various environmental sources and the tool components. Without a full understanding of these interactions, it is difficult to design a tool that can perform well inside many different cleanrooms. In this article, we summarized common cleanroom noise sources and their effects on the tool. We have further coupled this information with practical solutions, as well as some alternative ways of achieving the required design goals. These important insights and solutions serve as the guidelines for the robust design of the next generation high resolution inspection tools.